Porcelain sinks are commonly used in bathrooms and kitchens because the material, which comes in different colors and shades, matches almost any design or décor. While porcelain is fairly strong and durable, it's also prone to certain types of damage, including chipping and scratching. 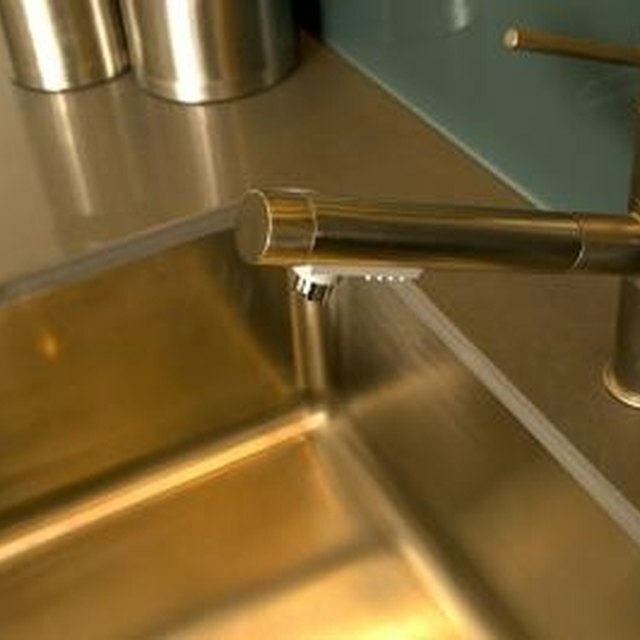 The sink may also develop thick rust stains, caused by a leaky faucet. Repainting the porcelain sink gives it a new look and it's much cheaper than replacing your existing sink. Painting a porcelain sink gives it a new look. Clean the sink thoroughly with your preferred bathroom cleaner. Apply an even coating of cleaner to the sink, including the sides and bottom. Rub the cleaner with a sponge and rinse the sponge under the tap. Rinse the sink with water and pat dry with a clean towel. Mix epoxy following the manufacturer's guidelines or if using a pre-mixed epoxy, squeeze a small amount into a paper cup. Dip a toothpick into the epoxy. Apply the epoxy to any damaged areas of the porcelain, such as chips or cracks, with the toothpick. Let the epoxy dry overnight. Press the toothpick against the epoxy to check if it's completely dry. Gently rub fine-grit sandpaper over the epoxy, removing any that adhered to the surrounding areas of the sink. Keep rubbing until the epoxy sits even and flush with the porcelain sink. Wipe away any dust with a towel. Paint the porcelain sink with a paint designed for use on porcelain. Apply a thin layer of paint to the sink with a paintbrush and wait for the first layer to completely dry. Add additional coats of paint, depending on the darkness or exact shade that you want. Check the top layer of paint and make sure that it's dry. Add a coat of clear waterproof sealant to all areas of the sink, including underneath the sink and on the sides. The sealant acts as a water deterrent and keeps water from reaching the paint and causing it to peel off the porcelain. To avoid getting paint on the faucets and other plumbing components, cover the pieces with masking tape. Only peel the tape off once the paint and clear sealant finishes drying.